Melocactus bahiensis (Britton & Rose) Luetzelb. 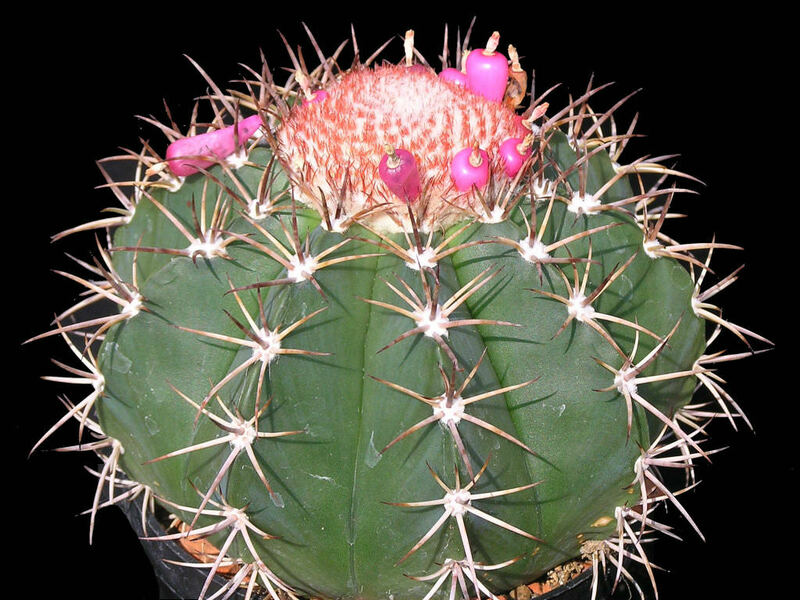 Melocactus bahiensis is a small globular cactus with ribbed stem capped by a cephalium with wool and brown bristles. The stem is globose or pyramidal, light to dark green, up to 8 inches (20 cm) tall and in diameter. The cephalium is mostly small with many brown bristles, up to 2 inches (5 cm) high and up to 3 inches (7.5 cm) in diameter. The spines are short, curved, off-white, except in the center where the new ones are yellow, reddish brown, dark brown to black often bent or even hooked in juvenile specimens. 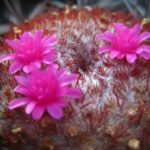 The flowers are pink, up to 1 inch (2.5 cm) long and up to 0.5 inch (1.2 cm) wide. The fruits are red to crimson on the top white or pale pink at the base, up to 1 inch (2.5 cm long) and 0.4 inch (1 cm)in diameter. 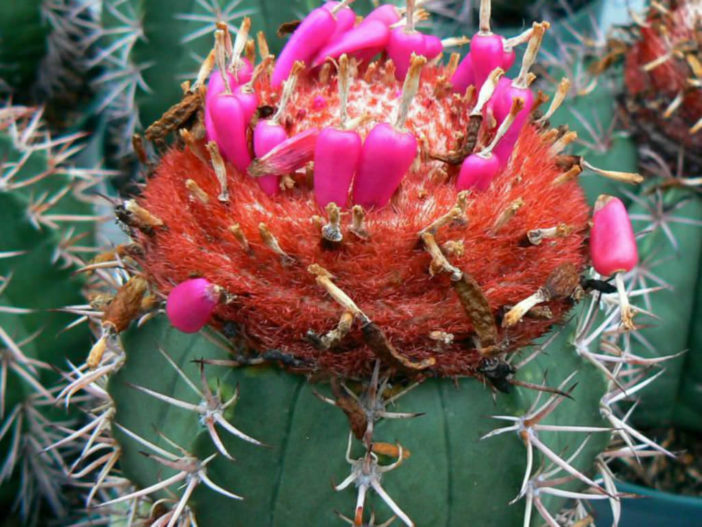 Melocactus are somewhat finicky cacti with unusual requirements. They shouldn’t be allowed to completely dry out, even in winter, and they can suffer from soil composition, drainage, water level, sun, and more factors that are difficult to control. 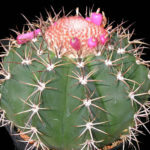 For that reason, these plants are best for growers who already have had some success cultivating cacti. Establish a balance with good aeration matched by ample water, good soil matched by good drainage, and these plants should continue to grow. 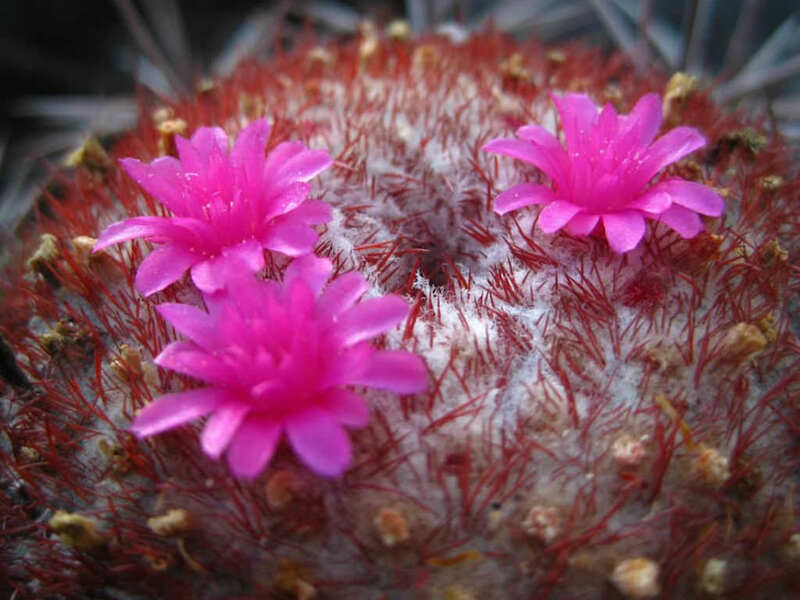 If they’re grown successfully, their unusual tops make them among the more beautiful of desert cacti.